Which films will be nominated for Best Picture at the 2015 Oscars? We’re currently slap bang in the middle of what is commonly referred to as ‘Oscar-bait’ season. This is when movies that are tipped for Oscars (or, more accurately, movies that want to be tipped for Oscars) are traditionally released, which is why you see a lot more serious people scratching their chins at the cinema than you do in the summer. As such, we now have a pretty good idea which films will be up for the illustrious Best Picture gong at next year’s ceremony, which is going to be presented by How I Met Your Mother’s Neil Patrick Harris. Without any further ado, here are the 2015 Best Picture contenders. The final 10 movie shortlist (expanded from 5 after the Great Dark Knight Scandal of 2009) is announced on January 15th. Instead of changing actors as his main character got older, Linklater filmed Boyhood over the course of 11 years and kept Ellar Coltrane (who was just 6 when he was cast) in the lead role. The sheer audacity of the project should be enough to earn the film a Best Picture nomination. Inherent Vice is an adaptation of a Thomas Pynchon novel, directed by Paul Thomas Anderson. Anderson’s films have been nominated for a couple of Oscars in previous years – with There Will Be Blood nominated for Best Picture in 2008 – although he’s never actually won one of the famous gold statuettes. With films like There Will Be Blood, The Master, Boogie Nights and Magnolia under his belt, it’s probably time he earned a bit more recognition from the Academy. Gone Girl, David Fincher’s adaptation of the Gillian Flynn novel of the same name, was a massive success at the box office, but that’s rarely an indicator of success at the Oscars. Luckily, the film has received excellent reviews too. At 88% on Rotten Tomatoes, the film is Fincher’s 3rd highest-ranked film after Zodiac and The Social Network (although, interesting, his only film to win the Best Picture Oscar, The Curious Case of Benjamin Button, received just 72%). A barely recognisable Steve Carrell takes on his first major ‘serious’ role in this biopic of John du Pont, a cocaine-addicted millionaire who sets up a training camp for America’s wrestling team. 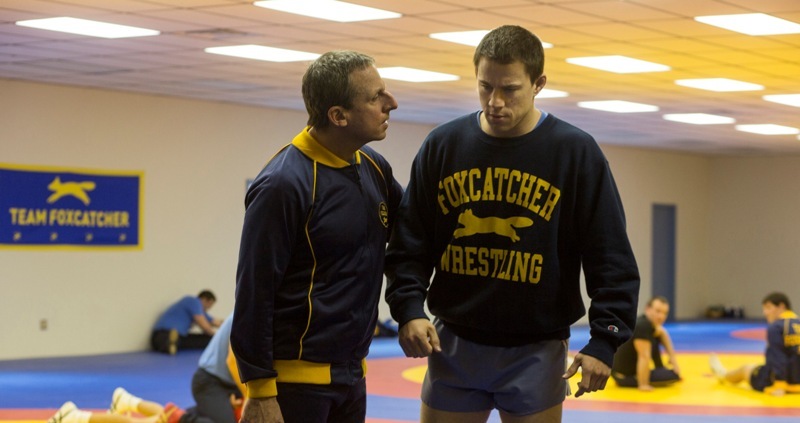 The story follows Olympic wrestling champion Mark Schultz (played by Channing Tatum), who joins du Pont’s Foxcatcher team along with his brother Dave. Things soon go awry, culminating in (SLIGHT SPOILERS…although it’s based on a real life story) Dave’s murder at the hands of du Pont. Carrell is a dead cert to be nominated for Best Actor, but the film itself has received a lot of positive attention too. It currently has 84% on Rotten Tomatoes. Despite the hype, Christopher Nolan’s space-drama hasn’t received the warmest critical response. However, it has received a lot of love from the movie-going public: it currently has 8.8/10 on IMDB, placing it at #12 on the site’s top 250 list. The cast has a strong Oscar pedigree too. Five of them – Matthew McConaughey, Anne Hathaway, Michael Caine, Ellen Burstyn and another cast member who we won’t reveal for spoilers-sake – have won Oscars, while a further three – Jessica Chastain, Casey Affleck and John Lithgow – have received nominations. Get On Up, a biopic of soul legend James Brown, received a lot of attention due to Chadwick Boseman’s sensational portrayal of the Godfather of Soul. This black comedy stars Michael Keaton as a washed-up Hollywood actor who is famous for playing a superhero called Birdman in a series of blockbuster movies (no prizes for guessing the inspiration for this film…). Birdman follows the Keaton’s character as he tried to write, direct and star in a play, despite being flat broke. The Theory of Everything tells the tale of Stephen Hawking’s relationship with his ex-wife Jane Wilde Hawking, and is based on Jane’s book Travelling to Infinity. Eddie Redmayne has been praised to the sky for his performance as Hawking, and Academy voters have apparently already marked The Theory of Everything out as one of the best films this year. Would you look at that? Another biopic! This one concerns British painter J.M.W Turner, an eccentric artist who kept two mistresses and fathered two children (yet denied being their father). The film has received massive praise, with a 96% rating on Rotten Tomatoes. However, Turner’s relative obscurity Stateside may lead to the film missing out on that all important nomination. Guardians... was one of the biggest films of 2014, but it’s a massive outsider in the Best Picture race. Avengers Assemble, a very similar movie from the same studio, received just one Oscar nomination despite breaking all kinds of box office records. Still, this could be the year the Academy finally decides to recognise the massive popularity of superhero films by nominating one for Best Picture. This well-received Wes Anderson comedy is another outsider, but it’d be nice to see Anderson acknowledged for his stellar work in the industry. He’s never had a film nominated for the main prize, although he has been nominated for Best Screenplay twice. Unbroken hasn’t been released yet, so it’s something of a dark horse. No-one is sure how good it’ll be. It seems to have everything it takes to earn a nomination though, with a strong story of American heroism and Angelina Jolie in her first directorial role. It’s based on the war experiences of Louis Zamperini (played by Jack O’Connell, better known as Cook from Skins), an Olympic hero who spent 47 days on a raft in the Pacific Ocean after a plane crash before spending a further 2 years in a Japanese prisoner of war camp. This biopic (!) of Alan Turing, the man who helped win World War 2 by cracking Nazi Germany’s Enigma Code, has been receiving a lot of attention thanks to Benedict Cumberbatch’s brilliant performance. Will it be enough to earn the film a Best Picture nomination though? Which of this year’s films would you like to see win the Best Picture Oscar? Let us know in the comments. Get cash for your unwanted films: sell your DVDs with musicMagpie!